Chances are you’re familiar with the Schroedinger’s cat paradox, whereby a hypothetical cat inside a box is both dead and alive until we open the box to see for ourselves. Now physicists at Yale University have figured out how to make a quantum cat that both lives and dies in two boxes at once. They described their work last week in Science. Technically, this isn’t an actual cat, but a so-called “cat state” in which two (or more) particles are in two different states at the same time. For decades, Schroedinger’s cat was just a morbid thought experiment, but in 2005 physicists at the National Institute of Standards and Technology successfully created an actual “cat state” in the laboratory. They used six atoms all in simultaneous “spin up”and “spin down” states—think of it as spinning clockwise and counter-clockwise at the same time. Since then, other physicists have created their own large cat states with photons. To create the state, they built a small chamber with two separate cavities made of aluminum. The microwave photons bounced around inside the cavities, and the team managed to connect them with a sapphire superconducting artificial atom. The result: two alive-and-dead cats made of microwave light in two different cat boxes at the same time. This research has implications for quantum computing. Unlike a classical computer, with bits representing 0's and 1's, a quantum computer stores information in “qubits.” A qubit can be in two states at once, both 0 and 1, just like Schroedinger’s cat is simultaneously alive and dead until a measurement or observation is made. But it’s a very delicate state. The quantum information must be shielded from all external noise in the surrounding environment. The slightest bit of interference—a single photon bumping into the atom you’ve used to encode and store your information, for instance—will cause the entire system to “decohere,” such that the superposition is lost. Cat states are of interest in part because they could be very useful for storing quantum information. 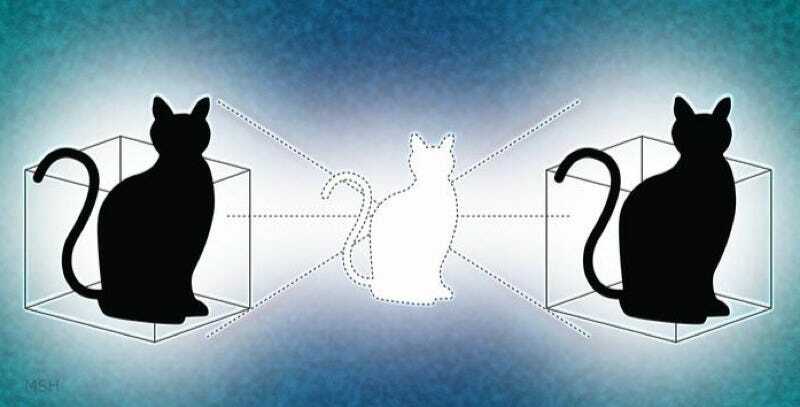 And being able to create cat states in two different boxes is “the first step towards logical operation between two quantum bits” that also enables error correction, according to co-author Robert Schoelkopf.